They’re performing in almost every city you can think of, causing pandemonium at every place that they go, and they’re winning over the hearts of everyone within milliseconds – they’re the one and only, worldwide phenomenon DVICIO. With hit songs like “Enamorate,” “Paraiso,” “Justo Ahora,” and “Nada,” to name a few, how can anyone not swoon over the incredible band, DVICIO?! DVICIO is a band that everyone has been talking about and it’s hard not to when they are taking the entertainment world by storm and leaving everyone mesmerized while doing so. Whether it is going to Thailand, having performances in Spain, making music in Mexico, or going on tour in the US, DVICIO shows that nothing can be a barrier, not even a difference in language, when the love and passion for music steps in and unites DVICIO fans together. DVICIO consists of five immensely talented, charming, and remarkable musicians including Andres Ceballos, Alberto Missis, Martin Ceballos, Luis Gonzalvo, and Nacho Gotor. They each are so musically inclined and have such a genuine talent for music. Their passion for the work they do is always evident and they always bring out musical masterpieces. Combine their impeccable talent, their charismatic and down-to-earth personalities, and their extraordinary music that we all can listen to over and over again and it’s like a blessing to our ears, then you have a recipe for creating one of the most stupendous bands on this planet. DVICIO’s music is not just music, it’s more than that. It’s something that touches the hearts and souls of listeners, it’s a way for a person to believe in love through music, and another way for people to just enjoy and cherish the impact that music can bring when it’s created as magnificently as the way DVICIO does. Wherever DVICIO goes, there are tons of fans there to support and see this spectacular band and it seems as though more and more as the days go by, there are new successes for this sensational band who truly deserves it all. DVICIO is one thing: a musical legend! I, Alexisjoyvipaccess had the greatest honor of covering the renowned and prestigious 2016 Latin American Music Awards as well as the three days of rehearsals leading up to the award show and I had the honor of catching up with and interviewing the phenomenal DVICIO again during the Latin American Music Awards rehearsals. DVICIO dished exclusively to Alexisjoyvipaccess all about what their pre-show rituals are before a performance (as they had an unforgettable performance at the Latin AMAs), what are some other upcoming projects they are working on that fans can look forward to (including some new music! ), and so much more only in our VIPAccessEXCLUSIVE updated interview. DVICIO even took on a fun “Most Likely To” speed round and they revealed who is most likely to cook the best meal, who is most likely to be the best dancer, and who is most likely to survive in a scary movie – find out what they had to say as well as their amazing message they sent out to their fans only in our VIPAccessEXCLUSIVE updated interview below. Thanks for another wonderful interview, DVICIO – always so marvelous to interview you guys! 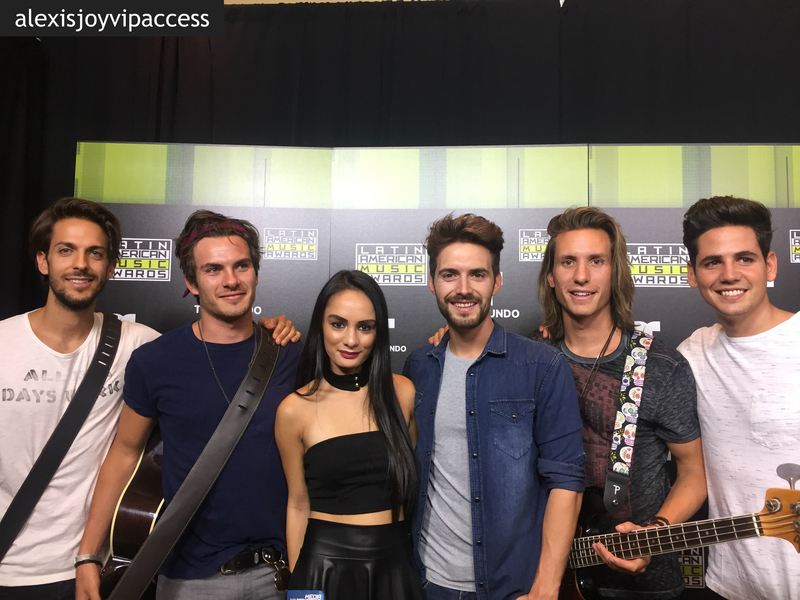 Check out my VIPAccessEXCLUSIVE updated interview with the remarkable and exceptional DVICIO at the 2016 Latin American Music Awards rehearsals below! Follow the @LatinAMAs on Twitter and Instagram and join in on the conversation by using #LatinAMAs! Previous VIPAccessEXCLUSIVE: The Remarkable Johann Vera Interview With Alexisjoyvipaccess At The 2016 Latin American Music Awards! Next Article: Big Congratulations To The Marvelous Addison Riecke On Joining The Cast Of Sofia Coppola’s “The Beguiled” Remake! Reblogged this on DVicio XXIV.